Who said vegans only eat salads and tofu? That is so 2003. Now it's 2017 and this vegan, yet very cheesy, quesadilla is both plant based and delicious. I am certainly not one of those "junk food vegans". I could eat Oreos and drink Mountain Dew all day and be considered vegan but I find it much more enjoyable to eat whole foods that nourish me from the inside out. But like I said earlier, that doesn't mean that all I can eat is salads and tofu. 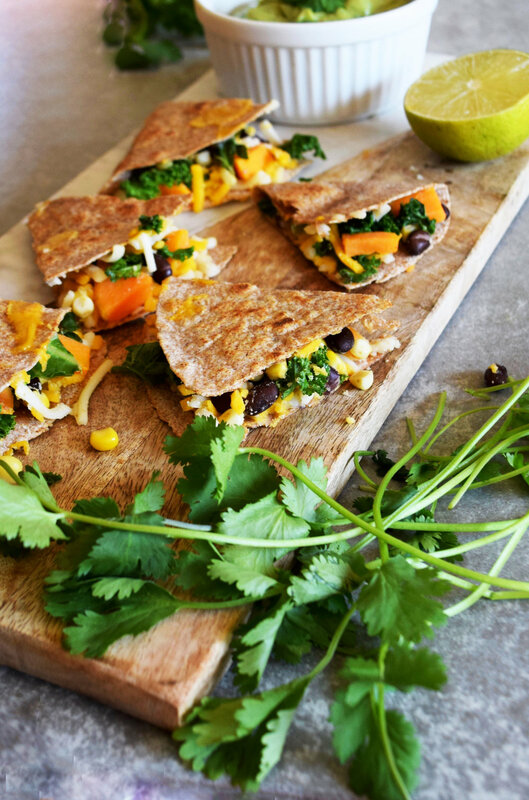 What's great is finding a balance between an indulgence and a healthy, satiating meal and this black bean + sweet potato quesadilla with a side of cilantro-avocado dip is exactly that. With a peeler, take the skin off of the sweet potato, cut into large cubes and steam until the potato is soft. About 15 minutes. When it's finished cooking and you can easily pierce it with a fork, cut it into small cubes. In a pan, sauté the corn on medium heat for five minutes until it begins to brown. Next, add the kale and beans and let simmer on low heat, stirring occasionally. In a food processor, blend together the avocado, lime, water, cilantro and salt and pepper to taste. Blend until completely smooth. If you like spice, you can add Jalapeño or hot sauce, too. Next, heat up a large pan. Brush a small amount of oil on each side of the tortilla. Lay the tortilla down in the pan and sprinkle some "cheese" on one half of it. Let it heat for moment, then add the sweet potato and corn, bean and kale mixture. Sprinkle a little bit more of the cheese on top. Fold the tortilla in half over the ingredients. With a spatula, press down on the folded quesadilla to help hold the ingredients together and then flip it. Let it cook for a couple minutes on each side. Repeat. 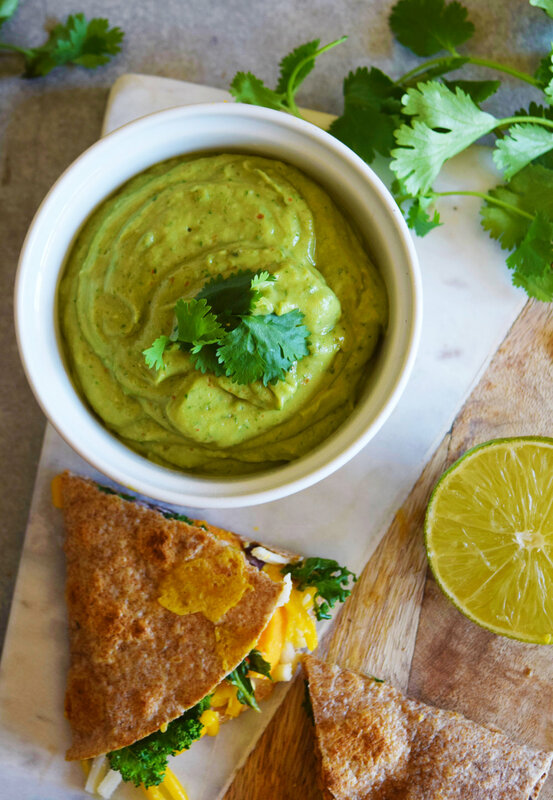 Serve the quesadillas with the cilantro avocado spread and maybe even a margarita!